CWAers in New Jersey stand strong with District 3 Mobility members. 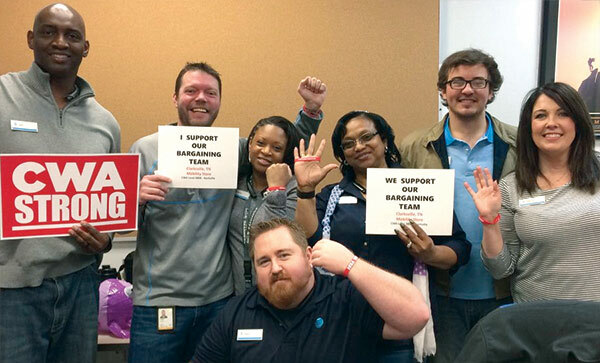 AT&T Mobility workers negotiated precedent-setting contracts that roll back offshoring and outsourcing and set a new standard for wireless retail and call center jobs in America. The "Orange" contract covers over 21,000 workers in 36 states and the District of Columbia and was approved by an overwhelming majority on January 12. Negotiators reached a tentative agreement on the "Black" contract, which covers 12,000 workers across 9 states and the U.S. Virgin Islands, on February 15, and the ratification vote is in process. The agreements provide a 10.1% pay increase over the four-year contract term, and shift $2,500 from commission to base pay for retail workers. Under the new agreement, AT&T Mobility retail workers will earn an average hourly wage of $19.20, about 74% more than the national average pay for retail workers. In a major breakthrough to keep good jobs in the U.S., the settlement includes a guaranteed increase in the volume of customer service calls handled exclusively by AT&T Mobility CWA members. The agreement also requires AT&T to find new jobs for workers when retail stores or call centers are closed. 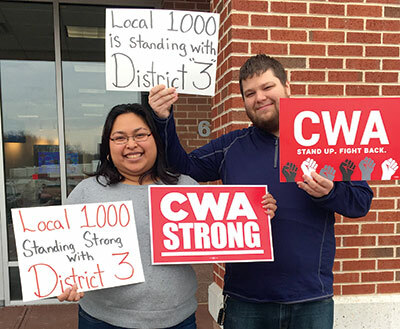 "AT&T wireless workers' victory is a watershed moment, for themselves and their families, and for working people across the telecom sector who are fighting to keep good jobs in our communities," said CWA President Chris Shelton. "Call center representatives, retail workers and techs from small towns and big cities joined together and refused to back down until they made good jobs at AT&T a reality. These contracts affirm the power of working people everywhere to join together and establish a new standard for America's retail and telecom jobs." During contract negotiations, AT&T wireless workers and community supporters took to the streets to build support for their demand that AT&T invest in its workforce, protect the basic promise of high-quality customer service, and reverse offshoring and outsourcing with a fair contract. During a three-day strike, AT&T was forced to close hundreds of retail stores and call centers across the country; this was the largest national retail strike in U.S. history. Wireless workers join together to make our union CWA Strong. Members of CWA Local 7200 in Bloomington, MN, mobilized every week in the fair contract fight. CWA Local 3808 members in Nashville stand together for a fair contract. Information is power! Keep up with the latest information from CWA by signing up for the weekly online newsletter.